We need $150,000 start up funds. 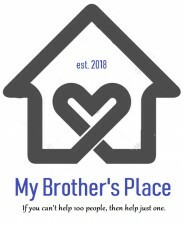 My Brother’s Place is a new organization seeking to help people in need. The idea for the organization followed an incident involving my homeless and drug addicted brother. For almost a year leading up to the incident, he had been using meth regularly and was homeless. He ate out of dumpsters and only worked to have enough money to get him his next high. He didn’t care about anyone or anything. He had lost his wife, his children, and all of his belongings. He was someone I didn’t know. On June 2, 2018, my brother was showering at a known “drug house”. My brother had been accused of stealing from a local drug dealer and the dealer came to collect. My brother was beaten, stabbed, and set on fire (twice). He was airlifted to Plano Medical City with third degree burns on 40% of his body and second and first degree burns on 80% of his body. He was in a coma for a week and he had five surgeries in 19 days. When asked why he was at that house – he responded by saying because he had no where else to go. Most of our family had turned our back on him. We fed him occasionally, but he wasn’t welcomed nor did he want to come to most of our homes. There are many more people just like him in our area. Data gathered by homeless shelters and other victim service providers – also known as Continuums of Care (CoC) –– track the homelessness across the country. It is estimated that on any given night of the week, there are 4,200 homeless people living in Oklahoma. Of that, it is estimated that around 200 individuals make up the known homeless population in Southeastern Oklahoma. That population in this area is likely to be much higher because it is difficult to calculate real numbers in rural areas. The majority of rural homeless find shelter out of public view. The number of homeless children or minors is almost impossible to track, but according to local sources, there are around 40 homeless children who live in Hugo. Children who go from house to house and stay with whomever will take them in for the night or for a short period of time. Some have resorted to criminal activities to eat or to have a place to sleep. They avoid raising red flags in fear of being placed in foster care or being returned to their parents. Some go to school full time, some occasionally, and some have dropped out completely. Rural homelessness, in general, is a challenge to assess and characterize, but the majority of the homeless in this area are classified as chronically homeless – someone who has been homeless for over a year or four or more occasions within the last three years. A significant number is a result of domestic violence, mental illness, and chronic substance abuse. In Choctaw County, outside of government or tribal assistance, there few services and no shelters that provide relief and support to the homeless. Most resources require an I.D. or an address. Most of the homeless who are substance abusers feel there is no help for them, are ashamed, and have turned their backs on those who care about them. Most non-users make fun or look the other way when they see a “crack head” walking down the street. My brother lived and is now an advocate for preventing homelessness and addiction. He has become well known as a street preacher and has been sharing his testimony with any and everyone who will listen. He has shown me the people currently affected by homelessness who need help. Some are veterans, some are women and children running from abuse, and some are a result of addiction. He has shown me some of the places they seek shelter. One older man’s shelter is no bigger than a large dog house – not enough room to stretch out on his back. My Brother’s Place will serve as a helping hand to all of them. No questions asked. We already have several individuals and businesses who have pledged monthly donations, but we are requesting $150,000 to build and operate My Brother’s Place until the end of 2018. Mrs. Parker started organizing fundraisers and assisting the homeless when she was a Senior in High School. Over the years, she has volunteered her time in several ways: soup kitchens, delivering food boxes, and once organized a memorial service for a homeless man. What a great idea! Thank you for doing this. It is really needed in Hugo. Let us know what you need going forward. We are very happy to help and look forward to doing more. "They Set Him On Fire - Twice!,"